Virginia Gov. Timothy Kaine speaks as President-elect Barack Obama looks on during a news conference at the headquarters of Democratic National Committee Jan. 8 in Washington, DC. Obama has named Kaine to be the new chairman of the DNC. WASHINGTON -- President-elect Barack Obama formally named Virginia Gov. Tim Kaine the next Democratic National Committee chairman on Thursday, pledging that the party would reflect their shared "pragmatic, progressive philosophy." "It's a philosophy that measures the strength of an idea not by whether it's Republican or Democrat, but whether it can actually solve a problem and make a difference in people's lives," Obama said at a brief news conference at DNC headquarters. Kaine, for his part, promised to be "a passionate and positive promoter" of Obama's agenda, "carry the proud banner of this proud party," and engage all types of voters in a new style of politics. With the announcement, Obama made a quick foray back into partisan politics during a transition filled with talk of bipartisanship. Even so, the Democratic standard-bearer signaled that he wanted the Democratic Party -- and his administration -- to be more inclusive than exclusive, more nonpartisan than ideological. He cast the party as a continuation of his campaign that attracted supporters from across the political spectrum and said: "We cannot afford to abandon the movement we've built. We have to strengthen it." Obama also called for building on outgoing chairman Howard Dean's strategy to compete in every state -- even Republican ones -- and redoubling efforts to reach all Americans by "finding candidates for elective office whose policies and plans are rooted not in ideology, but in what works." He praised Dean as "a visionary and effective leader," and Kaine said his predecessor did "a remarkable job." But Dean, who is stepping down Jan. 21, did not attend the news conference. He was traveling to American Samoa to attend the inauguration of the governor and raise money. Obama's transition officials gave Dean's travel as a reason for his absence but did not immediately respond when asked whether the former Vermont governor was invited to appear alongside the president-elect and Kaine. Democrats with knowledge of the situation, who spoke on the condition of anonymity to avoid angering the Obama team, said Dean, who sometimes clashed with Obama advisers, wasn't attending the event at the request of Obama advisers. Kaine plans to work at the party part-time until 2010, when his four-year term as governor is up and he can take over the DNC full-time. 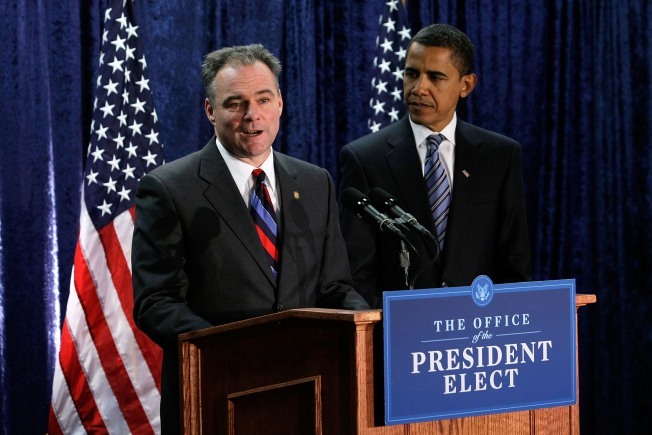 In February 2007, Kaine became the first governor outside Obama's home state of Illinois to endorse his presidential bid. He campaigned vigorously for Obama nationally and helped Obama become the first Democrat in 44 years to win Virginia in a presidential race. Kaine also was among the finalists for Obama's running mate before he settled on Delaware Sen. Joe Biden. Last fall, Kaine said he wasn't interested in the DNC job but he changed his mind when Obama pressed him to accept. Virginia Republicans have criticized Kaine for taking the political job while serving as governor. Kaine has said he will do the DNC job on personal time, evenings and weekends, and take almost no role through next month, while the state legislature is wrestling with a $3 billion budget crisis. At the DNC, he will be tasked with retiring the party's $15 million debt from November's election, reinforcing the message of the new Democratic administration, and preparing for the 2010 midterms and elections beyond. Kaine will be entering a new world of national politics that has starkly different fundraising rules than those he has grown used to in Virginia. That state, for example, allows unlimited political contributions, and the Southern Governors Association -- which he chairs -- raises tens of thousands of dollars in corporate money to fund its activities. But political giving is strictly controlled in the federal races that are the DNC's province. Corporate and union contributions are banned, and individuals can give no more than $2,300 per election to a candidate and $28,500 to a national party's political committee.